The ancient science of Ayurveda teaches that food is divine medicine with the power to heal--but the best foods for one person may not be beneficial to another. Unlike many diets with rigid, one-size-fits-all guidelines, Ayurveda is a lifestyle that recognizes the ever-changing needs of each individual. Join author Sahara Rose on a journey to wellness and discover how to eat according to your body's specific needs. Identify your dosha, or mind-body type, and find out what foods are best for your body. Learn how changes in season and climate affect your digestion and how to adjust what you eat accordingly. Rather than focusing on calories, you'll focus on food qualities. Rather than focusing on macronutrients, you'll focus on tastes--and you'll feel better than ever. Fall in love with cooking as you explore more than 100 plant-based, gluten- and dairy-free recipes for every meal of the day, including contemporary twists on classic Ayurvedic cuisine, such as turmeric-ginger quinoa kitchari and gut-healing seaweed broth. 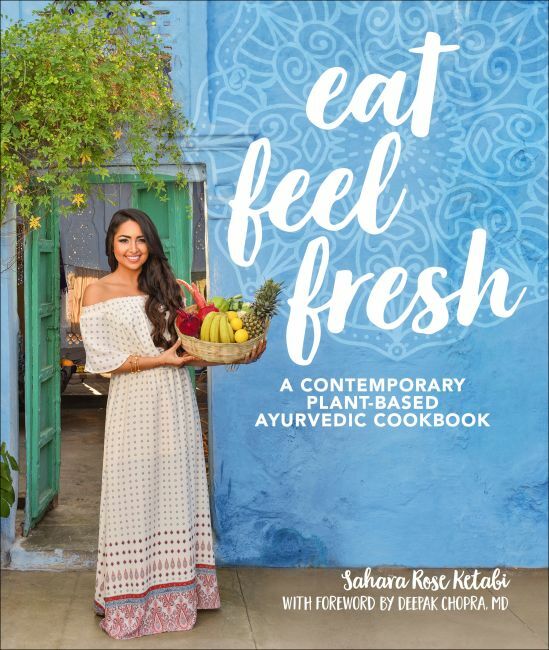 Packed with practical guidance and beautiful photography, Eat Feel Fresh integrates traditional Ayurvedic wisdom with contemporary nutritional science, and invites you to change your relationship with food and connect with your highest self.